Ever heard of a single stage air conditioner? What’s the purpose of a variable speed motor? Even if these terms only sound vaguely familiar, don’t worry — we’re here to help you learn about the types of air conditioners available. Next time you replace your air conditioner, you’ll be able to make an informed decision on your new unit. At the FL Green Team, we install and service all brands of central air conditioners in the Fort Myers area. (Our air conditioning service area spans from Port Charlotte, Punta Gorda, to Fort Myers, Sanibel, Fort Myers Beach, Lehigh Acres, Estero, Bonita Springs, Cape Coral and Naples.) The main brands we install include Trane, Rheem and Goodman. The following information is for the most part not brand specific although Trane offers some unique features that we discuss. In years past, most central air conditioners were single stage systems and this type of system is still popular today. Single stage means that your air conditioner is either all on, or it’s all off. It either runs at 100% capacity, or it cycles off. So, when your thermostat senses that the temperature in your home has reached the maximum setting – say, 80° – it signals the air handler and condenser to turn on. Both pieces of equipment run at full speed until the room is cooled to the thermostat’s temperature setting. This can cause temperature swings in your home. In some older systems, there can be as much as a 4-degree differential between on and off. This is an extreme example. However there needs to be a couple degree difference in between the on and off setting in this type of system, otherwise it would be constantly cycling on and off. These systems are at the lower end of the efficiency spectrum and have a SEER (seasonal energy efficiency ratio) of 14 or 15. The fan motor in the air handler of a single stage system is known as a PSC (permanent split capacitor) which isn’t controllable. The energy consumption is therefore fixed at a single maximum rate. If you are a part time resident in southwest Florida that owns a condominium and has a $20 per month electric bill, this type of system may suit your needs just fine. However, for full-time residents with year-round air conditioning needs, a more efficient system would be beneficial over the long run. These air conditioners have a single speed compressor with a variable speed air handler. In this type of system, when the thermostat calls for cooling, the compressor comes on at full speed while the air handler’s fan motor ramps up slowly until it reaches maximum speed. 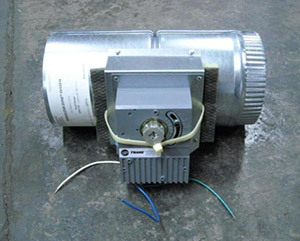 This type of fan motor is known as an ECM (electronically commutated motor). A Trane air conditioner with a variable speed motor can be set to come on at 50% capacity for a couple minutes, then ramp up to 75% for 6 minutes. If the temperature setting is not satisfied within that time frame, the fan motor turns up to full speed (100%). Not only does this save energy, but it also helps with humidity control. As the air flows over the evaporator coil at a lower rate, more moisture is absorbed. Trane also has the capability of additional enhanced humidity control. When a variable speed system is combined with a Trane smart thermostat, the ECM fan motor can be programmed to slow down as the temperature approaches the thermostat’s set point. This helps to achieve the desired humidity level. This technique is far superior to conventional de-humidistats that will run the temperature below the thermostat setting in order to achieve the set humidity level. During the summer months in Port Charlotte, Punta Gorda, Cape Coral, Ft. Myers, Sanibel, Ft. Myers Beach, Lehigh, Estero, Bonita Springs and Naples, humidity levels can be daunting. If you live here year-round, lowering humidity in your home can make your home more comfortable and save you money. For every degree you raise the temperature there is approximately a 7% savings. With enhanced humidity control most people can raise the temperature in their home while maintaining the same comfort level, saving them money on energy costs. Single stage/variable speed systems are rated at a higher efficiency level than pure single stage systems — around 16 SEER. For full-time residents, 16 SEER systems have the best “bang for your buck” when you consider the balance between equipment and installation cost vs. energy efficiency. This type of system has the same variable speed air handler with the ECM motor, but they also have a variable speed compressor. This makes communicating air conditioners the most sophisticated type of residential central air conditioner available. As mentioned previously, some thermostats can have as much as a 4-degree differential between on and off. The Trane XV system can narrow the temperature swings to one degree or less. The unit accomplishes this by communicating back and forth between the condenser and air handler. Instead of running at full speed, the condenser can run down to 20% capacity. By continuously running at a very low capacity for most of the day — even in the summer months — this type of air conditioner is able to practically eliminate temperature swings in your home. Only during the time of day when heat gain is the highest in your home, the compressor will ramp up to maintain your temperature setting. This technique maintains a superior comfort level in your home and save you money. It improves your home’s air quality as the air is continually filtered. Communicating air conditioners carry around an 18 to 20+ SEER rating. However, most homeowners don’t purchase communicating air conditioning systems to save money on their electric bill. People purchase the Trane XV systems because of their enhanced ability to maintain a constant comfort level, lower humidity and improve indoor air quality. Need Even More Comfort Control? Try a Zoning System. A great addition to a Trane XV communicating air conditioning system is the Trane ComfortLink II zoning system. Zoning systems allow you to set different temperatures in different spaces or rooms — called zones — in your home. This is especially beneficial in Southwest Florida, where the east side of the home is exposed to direct sunlight and heat gain in the morning, and the west side of the home gains the most heat in the afternoon. This can cause the temperature to differ significantly from one room to another. In the past many companies attempted to manufacture zoning systems without much success. Since they couldn’t control the air flow in single speed systems, motorized dampers in the ductwork would close off the cooler rooms and attempt to divert all the air flow to the warmer rooms. The problem was that the ductwork for those rooms wasn’t designed to handle the full flow of air from the air handler. Pushing the full air flow through one section of ductwork creates excessive static pressure and a lot of noise. 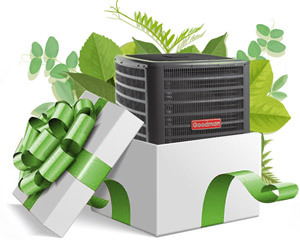 The Trane ComfortLink II zoning system combined with a communicating variable speed Trane XV air conditioner can adjust the air flow of the entire system so the proper amount of air is always distributed to each room. The Trane ComfortLink™ II Control acts as both a sensor and a zone thermostat. 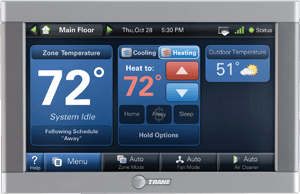 Temperature data is relayed to the Trane ComfortLink™ II Control, which allows temperature adjustment of an individual zone. It’s the perfect zoning system for a master bedroom or guest room. If it’s time to replace your home’s central air conditioning system, give the FL Green Team a call at 239.432.1500. We’ll schedule an appointment for one of our qualified service technicians to evaluate your existing central air conditioning and offer you options depending on your specific needs. We maintain integrity in our business, so we don’t use high-pressure sales tactics. Our pledge to you is that that we will be honest and provide quality products and installation at a fair price.